What does FASET entail? Is it different from Connect with Tech? The FASET Orientation program is designed to help students complete important college business prior to arriving for classes (academic advisement, course registration, student ID, book purchases, campus resources, banking options, and area services); to educate students on the academic and social atmosphere of Georgia Tech; to provide a forum for you to get involved with student organizations; and to incorporate students into the campus community. FASET gives you the information you need to know now that you are a Tech student. Connect with Tech is designed to give you a glimpse of the GT experience for you to better make your college decision. How do I pay for FASET Orientation? All FASET related fees will be billed to the student's account through Georgia Tech's Bursar Office (404.894.4618). These charges will be placed on the student's account right before the student's orientation session. Can I still register for classes if I don't come to FASET? FASET Orientation provides you the earliest and most convenient way to register for classes. How do I change any of my personal information, my major, or my assigned FASET Session? 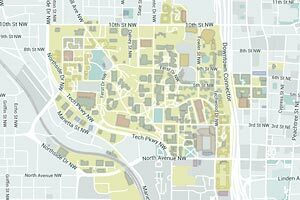 To update your permanent address or major, you may edit your information by visiting buzzport.gatech.edu. Click "application details" under the application quick view tab, then select "notify undergraduate admission." Once the option opens, you can update your information as needed. While FASET is not mandatory for any student, attendance is highly recommended and over 98% of last year's incoming class attended. The program helps to facilitate the transition process into Georgia Tech and provides the earliest and most convenient advisement and registration process. What are the Georgia Tech medical immunization requirements? All students entering Georgia Tech are required to submit their immunization information to satisfy the Board of Regents immunization requirements. It is highly recommended that the requirements be completed with your family physician or at Stamps Health Services prior to starting classes. All immunization requirements and the associated forms may be found at www.health.gatech.edu and clicking on Immunization Requirements. Please read all the information carefully and submit the forms by downloading and entering the information as the instructions direct. If you need assistance, please email us at immunizations@health.gatech.edu or you may call 404-894-1432. If you and your student are attending a FASET session and are lacking any of the requirements, you may come to Stamps Health Services and receive any or all of the required immunizations. Please call 404-385-4995 for an appointment. How do I make a change to my FASET registration? You can change your FASET registration by logging into the FASET Registration system and choosing the desired session as long as there are seats available. All sessions close 15 business days before the session. What happens if I do not get my classes when I register at FASET? FASET is the first opportunity to register for classes, not the final one. There is typically a lot of activity in Phase II registration and we find that students who could not get the classes they wanted or needed at FASET typically do get them in Phase II registration. Also, after the FASET cycle the academic units are looking at available seats and making adjustments in anticipation of Phase II registration. Our primary focus is to get the students enrolled full-time in the classes they need, not necessarily in the classes they would prefer at the times they would prefer, with the instructor they would prefer, etc. We will try our best to have the students enrolled full-time in classes that apply to degree requirements. If there are concerns as Phase II registration begins, the student should first contact his/her academic advisor and then contact the Registrar’s Office as needed. What bedding is provided for overnight stays? First-year students who attend FASET 1-5 are provided a pillow, sheets, and a towel. The rooms do get cold, so it is suggested to bring a blanket. What should I bring with me to my FASET session? For any student who is over the age of the 18 by the start of his/her FASET, you will be able to fill out an online Waiver Form. If you are under the age of 18 you need a printed copy of the FASET WAIVER FORM signed by you and your parent/guardian. If you are attending FASET 1-5, a pillow, sheets, and a towel are provided. The rooms do get cold, so an additional blanket is suggested. What time does FASET start and end? Check-in for all Fall First-Year FASET sessions begins at 8 AM on Day 1. The program ends around 6 PM om Day 2. When are residence hall assignments sent out? Housing assignments are sent out throughout the summer. In July you should receive notification about the side of campus you will be living on (East or West Campuses). Around the first week of August, you will receive the specific room assignment with contact information for your roommate. Check-in for Exchange FASET sessions begin at 7:45 a.m. on the 1st Floor of the Student Center and ends around 6 p.m.
For any student who is over the age of the 18 by the start of his/her FASET, you will be able to fill out an online Waiver Form. If you are under the age of 18 you need a printed copy of the FASET WAVIER FORM signed by you and your parent/guardian. What time does Transfer FASET start and end? Check-in for all Transfer FASET sessions begin at 7:45 a.m. on the 1st floor of the Student Center and ends following class registration around 6pm. Official transcripts are preferred; unofficial ones can be brought to campus if an official isn't available. FASET is a great program that will introduce you to the resources and traditions that make Georgia Tech unique. Though you may have completed an orientation at your past institution, we strongly urge you to attend FASET. One major reason, is that it will allow you to meet your advisor and receive guidance on your first GT class registration process. With short turnarounds between past semesters and the beginning of your Tech career, these sessions allow clarification and an opportunity to review with your college and advisor. Where does Wreck Camp take place? When do we get back on Saturday? On the final day of Wreck Camp, we will close out our experience and head back to Georgia Tech, arriving back at the Student Center by late afternoon. How do I pay for Wreck Camp? All Wreck Camp related fees will be billed to the student's account through Georgia Tech's Bursar Office (404.894.4618) after registration closes on July 28. Early Move-in fees will also be charged to your student account. Do you have to be athletic or extroverted to attend? NO! Wreck Camp offers a variety of activities appealing to all types of students. Who Can Attend Wreck Camp? Georgia Tech is committed to providing all new students with the opportunities and information that will help them achieve their goals and be successful at the Institute. First year students, transfer students, and new international students are invited to take part in the Wreck Camp experience. What is Wreck Camp International? Why should I go to Wreck Camp? Easy! Three words: Community Building, Traditions, Transitions. Coming to camp gives you the opportunity to meet other new students in a fun, camp environment. During your time at Wreck Camp, you will be in small groups led by two upperclassmen student leaders, color-themed teams, and the overall large camp. While having a great time in the activities, this experience allows you to help make your transition to Tech easier by creating new bonds and friendships with a diverse group of students before ever arriving on campus. Georgia Tech has a rich history of traditions and a great story to tell. Coming to camp ensures that you will learn all about these traditions, including singing the fight songs, pulling pranks with George P. Burdell, and practicing for the Freshmen Cake Race. Through camp, we will teach you more about our school and its wonderful history. Wreck Camp will not only help you to be more prepared coming to Tech next fall, but it will also give you a chance to learn more about yourself through insightful activities and interactions in small groups with our staff. We will also help identify your individual strengths and goals that will help you to succeed in your new college environment. We want you to have the best first year at Georgia Tech you can, and Wreck Camp is a great way to get ahead of the curve! **Out of 3,000+ responses on the 2015 Student Experience Survey, students who attended Wreck Camp were more likely to rate their overall Tech experience favorably, rating higher than any other organization/involvement. Yes! Early move-in is available for students participating in Wreck Camp for an additional fee of $50 per night. Students moving in early will be able to check-in and drop their belongings in their room either on Tuesday or Wednesday before Wreck Camp begins. This options is only available to students who live three or more hours away from Georgia Tech. What if I'm an international student who can't attend Wreck Camp? Can I still attend the Day of Programming? Something came up, how do I cancel? All cancellations must be made in writing to New Student & Transition Programs. For a full refund, please cancel before June 1, 2019. Cancellations made after June 1, 2019 will include a refund of the registration fee less a $50 administrative fee. After July 19, 2019 at noon no refunds will be given for the program. To request a cancellation/refund, please e-mail transitionprograms@studentlife.gatech.edu. What should I pack for Wreck Camp? Wreck Camp is an extended orientation experience for incoming students to Georgia Tech. The program takes place off-campus at a retreat center over four days and three nights and focuses on helping incoming students transition to Tech through creating connections with other students, learning many Tech traditions, developing leadership skills, and having fun in a summer-camp setting. Incoming students will also connect with upperclassmen student leaders who will lead them throughout camp. It’s an experience you don’t want to miss! We strongly encourage you to get dropped off on campus as Wreck Camp does not provide parking accommodations. However, if getting dropped of is not an option, please check out the Parking and Transportation website to view Georgia Tech's paid lots and corresponding rates. We would recommend parking in the student center lot or visitor area 3 to be close to check-in and kick-off activities. I don't like the outdoors, is Wreck Camp actual camping? Good question! No, Wreck Camp is not an outdoor camping program. Wreck Camp is similar to a “summer camp” that you either attended or saw in movies. We will be staying at a retreat center with cabins and air conditioning. If you are interested in doing an outdoor trip before starting at Tech, look at Tech Treks through the Campus Recreation Center (www.crc.gatech.edu). What does WCHY stand for? "Wreck Camp" - "Hell Yeah!" our favorite call and response! Is there a specific FASET session that I should attend if I plan to attend Wreck Camp? Currently, there is not a preferred FASET that Wreck Camp participants should attend. If you are coming from out of state, please note that the later FASET dates (FASET 6 & 7) are reserved for those coming from long distances and back up to our Wreck Camp dates. When will registration open and close? Registration will open March 1, 2019 and close July 28, 2019. What is the cost of Wreck Camp? Are scholarships available? Wreck Camp costs $300 per student to attend. This includes all meals, lodging, transportation to camp, and a t-shirt. Wreck Camp international costs $550 per student to attend. This includes all meals, lodging, transportation to and from camp, two t-shirts, FASET 6 registration fee, and the additional day of programming cost. If you choose to move into your fall residence hall assignment early, there is an additional cost per student. NSTP does offer a limited number of needs-based scholarships to student attendees. Click here to access the application form.